So what happens if you cannot afford to invest in stock on the chance that it will sell and make you some money? It would seem that the dream of running your own successful business in doomed. So I dug deeper into the eBay market place and realised that this was very easy to do if you approached it the right way. So I started to sell software's that are available COMPLETELY FREE, Software's that I could re-brand as my own and sell on complete autopilot. Its all completely legal and ethical. These are in demand products and they sell like gangbusters… I could have sold commercial software from Microsoft or Adobe but the margins are razor thin or none existent and let face it its too much like hard work. With my system I get to keep 100% of the profits for myself! So What I Did Was To Build A Portfolio Of Profitable Products, And Add To It Every Month, And Here Are Just Some Of The Results! So How Well Does It Work? Just Take A Look! 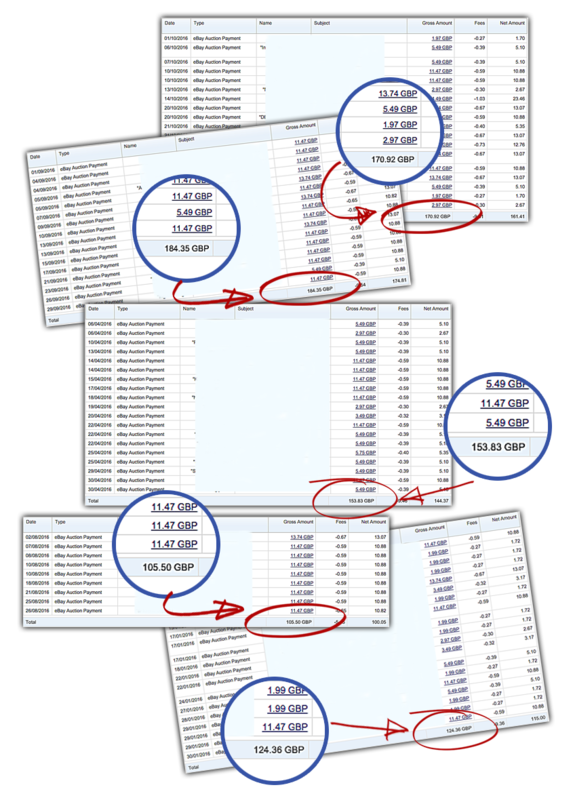 I created Software Profits Exposed (SPE). Inside I blown the barn doors off this profitable little business and show you the exact sources that I use to grab great software products completely FREE. Products that sell like HOT CAKES! I then show you how to RE-Brand them and list them on eBay so that you can profit from them too. The great thing about this business is that you never run out of products and you can add hundreds of new software items to your inventory all for FREE. Just imagine the difference several hundred dollars a month (or a few thousand) could make to your lifestyle. 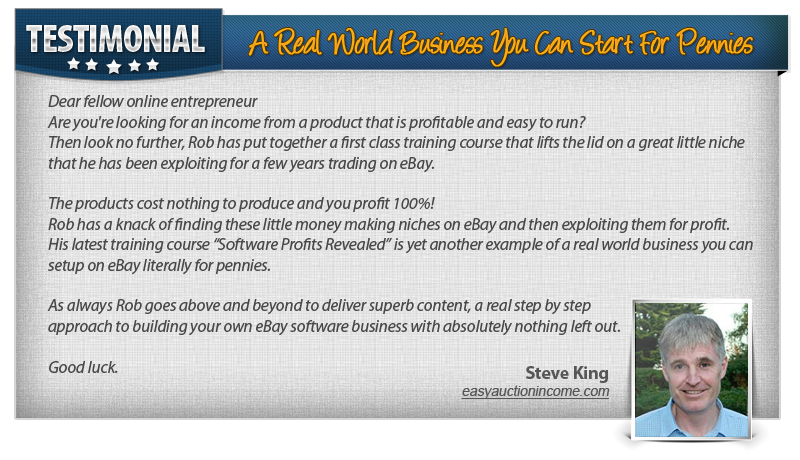 Exactly How To Build Your Own Software Business On eBay Just As I Have Done. Where to obtain these product completely for free, which you can legally rebrand, make them uniquely yours and sell keeping all the profits for yourself. 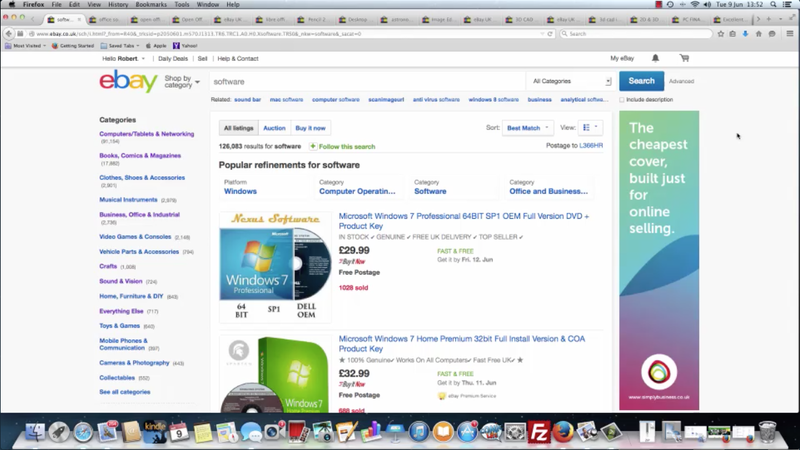 Watch me re-brand a niche software product, then list it on eBay grabbing the top spot in that niches listings in just 40 minutes, in competition with 113 competing items. How to sell even more software items just from the initial sale. I will show you the methods I use to sell even more products from the initial sale. Then I show how you can build a list of buyers who will just keep on buying from you. In this e-course I give a complete set of watch over the shoulder videos that takes you through the business blueprint step by step with nothing left out. And that's not all included in your membership are all the following benefits. Access your course in the secure members area, plus some special bonus items. Access to the complete system I developed for profiting with open source software absolutelywith nothing left out. Access to my eBay listing template that I had exclusive created for this customers of this course. My dedicated support desk, no question goes unanswered. Just follow the over the shoulder videos, if you need support I am always there to help or if just want some advice there is the Easy Auction Income Exclusive Facebook Group to join. Yes you really can get started within minutes and build a complete portfolio of profitable products in a just few days. Follow my step by step video training where I take you by the hand and show you the vibrant software market on eBay. I then show you how to find best selling software for FREE, how to re-brand a product to make it UNIQUELY your own. How to list it on eBay, author the CD-DVD template to give the customer an excellent buyer experience. And then how to build a portfolio of top selling products. Nothing is left out simple watch and apply what you see in the training videos. Plus I Have Added Some Exclusive Bonuses!! 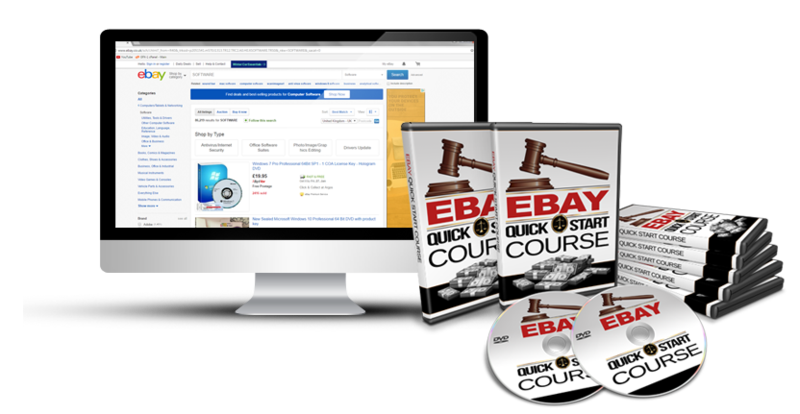 I have shot a complete training series on how to get the best out of eBay for Newbies and the experienced eBayer alike. I show you all the free tools that eBay provide to help you be more productive and to sell more products. 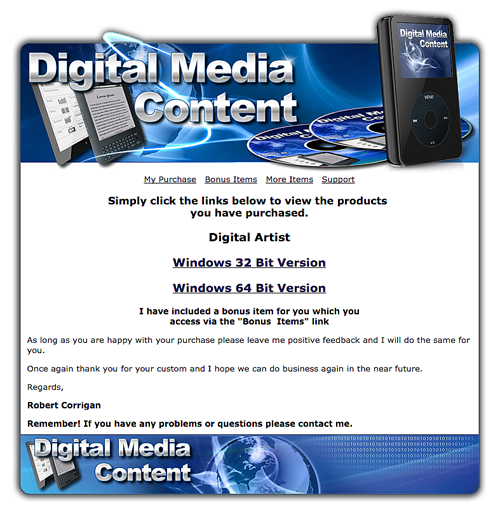 An EXCLUSIVE CD-DVD for my members for you to deliver your software content to your customers. Follow the instructions in the training videos to show you how you can make even more sales for the initial purchase and build a buyers list that will buy from you time and time again. 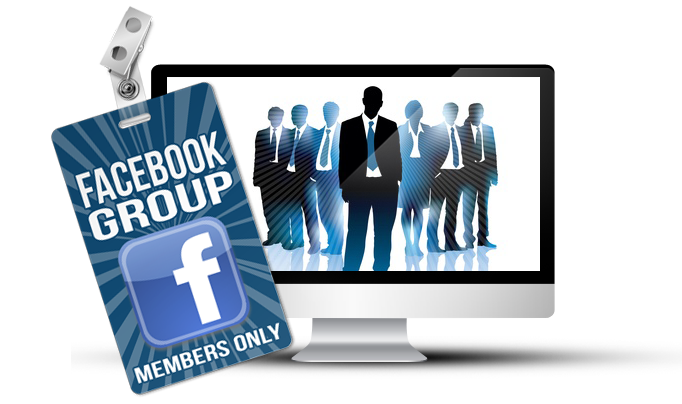 Access to the members only Facebook group specifically set up for eBayer to help you exchange idea and to build your business in the company to friends and fellow entrepreneurs. Access to all the techniques and systems that I use to run my own eBay Software Business. Including sources of FREE software that you can rebrand and resell and keep 100% of the profits. Access To The Easy Auction Income Exclusive Facebook Group, a vibrant group of eBay entrepreneurs who share tips and ideas on profiting from one of the biggest shop windows in world. All the tools and templates that I have developed over the years plus ones that I have had specially produced for this course. Immediate access to all my bonuses and other resources to get you started straight away. It took me months to learn some of this stuff and you get all of this as part of my comprehensive training.